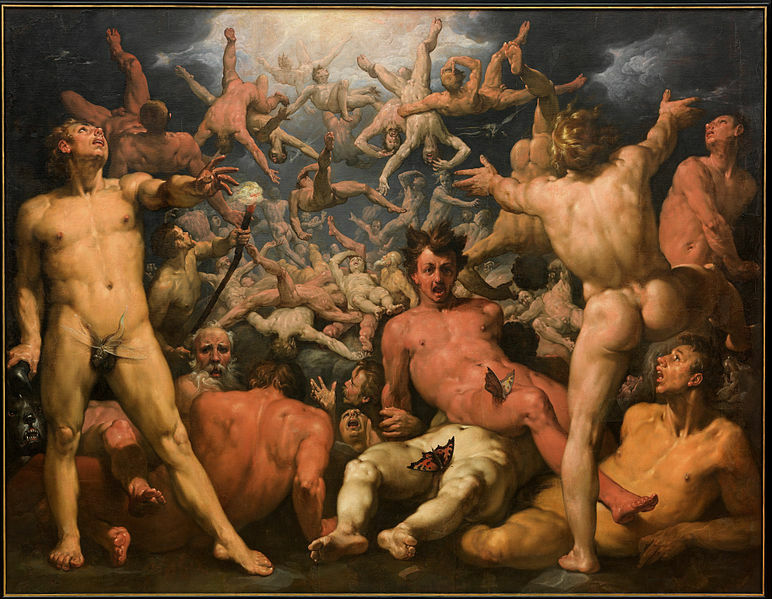 The Titanomachy is one of the pivotal moments of Greek mythology, and was the point in time when one generation of gods, the Titans, were replaced with another, the Olympians. The word Titanomachy effectively means the War of the Titans and was a ten year war fought through a number of battles between two sets of enemies. Unfortunately details of the war do not survive into the modern day, and the only reference point today comes from the Theogony (Hesiod), but this work details with the genealogy of the gods rather than being a detailed story of the war. In antiquity there was certainly likely to be several works relating to the War of the Titans, and it is certainly known that there is a lost epic called the Titanomachia (attributed to Eumelus of Corinth), but the surviving fragments of this work, provide no real details. Some details though can be ascertained by looking at the Theogony and gleaning detail from other Greek myths. Prior to the Titans the cosmos was ruled by Ouranos (Sky), one of the Protogenoi, but insecure in his position he locked up his own children the Hecatonchires and Cyclopes within the belly of the earth. This angered Gaia (Earth), the mother of Ouranos’ children, who then plotted with another group of Ouranos’ children, the Titans. Cronus would wield an adamantine sickle against his father, castrating Ouranos, and removing most of the sky god’s powers. As Ouranos retreated to the heavens, the god would predict that just as he had been overthrown by his son, so Cronus himself would be overthrown by his son. It was a prophecy that was repeated by Gaia when she discovered that Cronus had no plans to release the Hecatonchires and Cyclopes; and indeed the Titan lord had added an extra guard in the form of the dragon Campe. Cronus would then seek to circumvent the prophecy by swallowing whole his children, born to Rhea, imprisoning them into his stomach; and in this way Hestia, Demeter, Hera, Hades and Poseidon were swallowed. A sixth child of Cronus, Zeus, would have followed but Rhea and Gaia spirited him away to a cave on Mount Ida on Crete. Zeus would grow to maturity upon Crete, and would then return to try and overthrow Cronus. Working with Gaia, a potion was concocted, and presented by Rhea to her husband. The potion forced Cronus to regurgitate, and release, the five sibling imprisoned within him. The six siblings then retreated to Mount Olympus, and it was there that Zeus called an assembly of the gods, proclaiming that any who sided with him would retain all their rights and privileges, but those who opposed him would lose everything. War was inevitable, and the female siblings, Demeter, Hestia and Hera were sent to safety. ​Hera it was said went to live with Oceanus and Tethys, for Oceanus would later, when she was married to Zeus, aide her with her husband’s infidelities. It might seem strange that Hera went to Oceanus and Tethys, for they were first generation Titans, but not all Titans fought with Cronus and his cause. Oceanus decided to remain neutral, and the female Titans, the Titanides, did not fight either. The basic Titan army therefore consisted of Cronus, Iapetus, Hyperion, Coeus and Crius, and two sons of Iapetus, Atlas and Menoetius. Iapetus was known for his fierceness as was Menoetius, but it was Atlas who was given the role of battlefield leader. Two further sons of Iapetus, Prometheus and Epimetheus, did not fight though, for Prometheus was forewarned about how the war would end. Other named allies of the Titans though included the Gorgon Aix (the Terrible Goat) and the god of stormy seas, Aegaeon. The Olympians started off with Zeus, Hades and Poseidon, but they were soon joined by others. First to join was the goddess Styx, a daughter of Oceanus, who was urged by her father to join the side of Zeus. Styx brought along her four children Nike, Cratos, Zelos and Bia. Nike would become the charioteer of Zeus during the war, whilst all four children of Styx would also act as the guardians of Zeus throne later on. Another child of Oceanus, Metis, also joined the forces of the Olympians, and the goddess of Wisdom would act as counsel to Zeus during the war. Battle-lines were drawn with Zeus and his allies based upon Mount Olympus and the Titans upon Mount Othrys. Aegaeon and the Gorgon Aix were vanquished by Zeus during the Titanomachy, but ultimately both sides proved evenly matched, but as the war went on so the earth trembled, the air (Chaos) burned, the waters boiled and the sky creaked and groaned. Gaia then intervened and told Zeus that victory could be assured if he released the Hecatonchires and Cyclopes from their imprisonment. So Zeus travelled deep into Tartarus , and there he fought with the mighty Campe, killing the dragon guard and freeing the prisoners. This possible occurred as late as the tenth year of the war. This proved to be a master stroke for upon their release the Cyclopes, who were skilled artisans, crafted weapons for Zeus and his brothers. Zeus was furnished with his lightning bolts, Poseidon was given a mighty trident, and Hades was presented with the Helmet of Invisibility. Even more useful to Zeus’ cause were the hundred handed Hecatonchires, for when restored after partaking of ambrosia and nectar, were mighty in strength and able to throw mountains as artillery shells. The Titans were said to have strengthened their ranks, but Zeus was now unstoppable, and from his chariot, guided by Nike (Victory), Zeus threw down his lightning bolts, and one such bolt struck Menoetius, sending him into the depths of Tartarus. A version of the end of the war sees Hades don the Helmet of Invisibility and enter the very camp of the Titans upon Mount Othrys, and destroyed their weapons and armaments, destroying the Titans ability to fight; the war thus ended after ten years of fighting. ​The war did come to an end and as promised Zeus punished those who had opposed him. 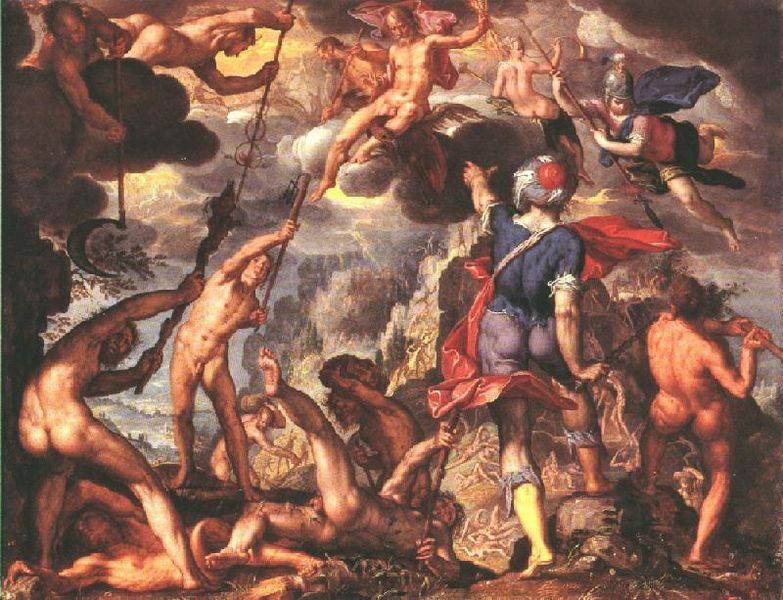 The male Titans were sent to Tartarus to be imprisoned by new bronze gates crafted by Poseidon and the Cyclopes, and the Hecatonchires were given the position of prison guards. 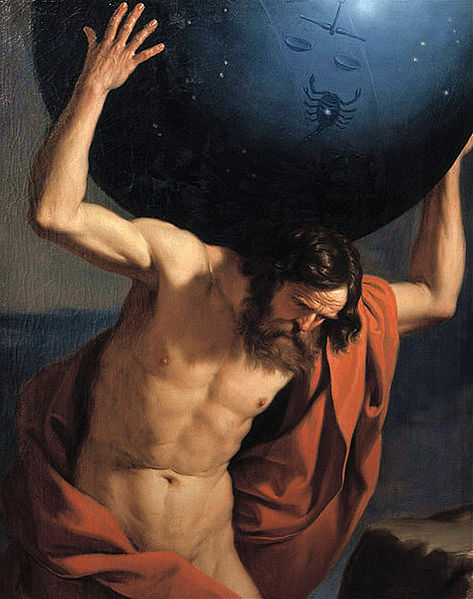 Atlas was given special punishment though for he was charged with holding up the damaged sky (Ouranos) for all eternity. The Cyclopes would not return to Tartarus though and would become craftsmen for the gods with forges upon Mount Olympus and beneath various volcanoes. The female Titans remained free for they had taken no part in the war, Oceanus retained his privileged position as god of freshwater, and Prometheus and Epimetheus were given the job of bringing forth life to the earth. The allies of Zeus were rewarded Styx, was made a power river goddess whose name was invoked for unbreakable oaths, whilst her children would be given privileged positions upon Mount Olympus. Metis would become the first wife of Zeus. The cosmos was itself divided amongst the three male Olympians through the drawing of lots. So Hades was given dominion over the Underworld, Poseidon became lord of the world’s waters, and Zeus became lord of the heavens, and with it the position of supreme deity. One deity though who was not satisfied with the outcome of the Titanomachy was Gaia, for although her children, the Hecatonchires and Cyclopes had been released, they had been replaced in Tartarus with other children of Gaia. Ultimately, Gaia would cajole the Gigantes, another set of children of Mother Earth, to rise up against Zeus in the Gigantomachy.